i've bought a few Days ago a Duet Wifi Board and got everything to work except 1 Thing. I connected my Z Probe (capacitve) like this and try to get a Signal from it. The Probe lights up if it is close enough to my Buildplate but the Software don't get that. I already tryed to understand how to change the config but i cann't get it to work. M552 S1					; Enable WiFi. Disabled for setup and testing. Enable once set up on your network. Edited 1 time(s). Last edit at 04/27/2017 10:08AM by DeathmannX. One problem I see right off is you are applying 5v to a 3.3v input. The Duet is a 3.3v logic board, not 5v like the 8 bit Arduino ones. Also, when posting your configuration file, it is a good idea to blank out the password. On your G31 line, you should lower the P value. When the probe is away from the bed, check the probe value in the web interface. Set the P value about 10 over that. I changed the Mode to P5 and set the H Value to 5 and 10. If i remove the I1 the Probe is always triggered. In the Webinterface i can see that to. But what can i try now? Edited 1 time(s). Last edit at 04/27/2017 10:42AM by DeathmannX. Putting that much voltage in to a 3.3v input could burn out the input. But with it being an analog input in this case, you might be okay. When the probe is triggered, the output voltage should be 3.3v. When not triggered, it should be close to 0v. You need to correct those voltages. Thx do you know how to do that? I got only 5x 150k Ohm and 5x 100k Ohm. Personally, I use a mosfet instead of a voltage divider. 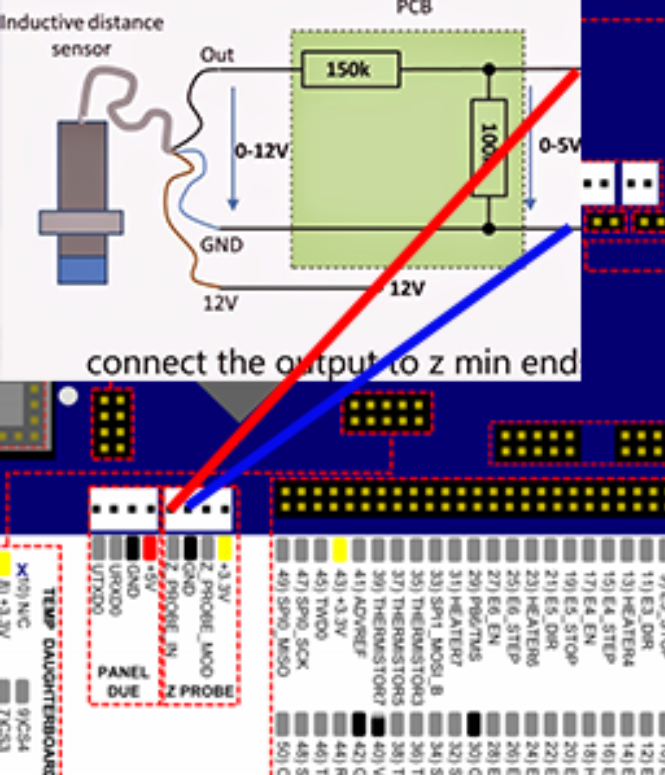 Gate of the fet goes to the output of the sensor. Drain goes to 3.3v. Source goes to the Z probe input. A 2N7000 works for this. Edited 1 time(s). Last edit at 04/27/2017 12:36PM by ElmoC.